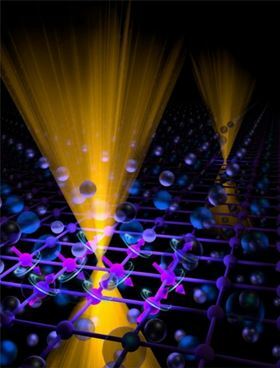 Charge carriers in a new type of magnetic material could help overcome some of the limitations such as quantum effects and heating that are hindering the further miniaturization of electronic circuitry for future information processing and storage devices. John DiTusa of the Louisiana Consortium for Neutron Scattering, Zhiqiang Mao of Tulane University, New Orleans, and their colleagues there and collaborators at Oak Ridge National Lab, the National High Magnetic Field Laboratory, Tallahassee, Florida, Florida State University, the University of New Orleans, Louisiana State University, Baton Rouge, have observed topological behavior for the first time in a magnet, Sr1-yMn1-zSb2 (y, z < 0.1). [DiTusa et al., Nature Mater. (2017); DOI: 10.1038/nmat4953]. The term topological materials refers to substances in which the current carrying electrons act as if they have no mass and so behave more akin to photons. Such an electronic state is sustained by symmetry and is not perturbed by crystal defects or disorder. The near-zero mass electrons are due to relativistic effects. The result is exceedingly high charge carrier mobility with very little resistance, which could be exploited in highly efficient devices that have far less heat dissipation requirements than conventional devices. The team's new magnet displays such an electronic state but the magnetism of the material brings with it an important symmetry breaking property - time reversal symmetry - which gives rise to the magnetic Weyl semi-metal phase. The team suggests that such a material might now be used to investigate in detail and obtain additional evidence for this much sought after phase and allows materials scientists to test the consequences of its existence. "This first observation is a significant milestone in the advancement of novel quantum materials and this discovery opens the opportunity to explore its consequences. The nearly massless behavior of the charge carriers offers possibilities for novel device concepts taking advantage of the extremely low power dissipation," DiTusa explains. The team explains further that their material exhibits a ferromagnetic order for a T value between 304 and 565 Kelvin. However, it shows "canted" antiferromagnetic order with a ferromagnetic component below the lower temperature. "The combination of relativistic fermion behavior and ferromagnetism in [this material] offers a rare opportunity to investigate the interplay between relativistic fermions and spontaneous time reversal symmetry breaking," the team concludes.